This article is intended to help you resolve problems with payments that have failed to be collected from your clients. Why might payments be rejected? Insufficient funds - there are not enough funds available for the transaction to be processed. Credit card expired - the card has expired and can't be used any more. Credit card declined - unfortunately sometimes the issuing bank does not disclose the reason that the payment has been rejected. Incorrect BSB or bank account number (Australia only) - your client has provided an incorrect BSB number or account number. If you need to add another payment method to resolve the problem, you can send the client a link to the Client Portal where they can enter new payment details, or you can add new credit card details in Practice Ignition on their behalf. Who will be notified when a payment is rejected? You can choose who should be emailed when a payment is rejected. To do this, go to Settings and then Payment Gateway. Under Notifications you can add one or more email addresses. It's also possible to view all rejected payments by choosing Payments from the left hand side menu and then selecting the Rejected tab. How do I try to collect the payment again? 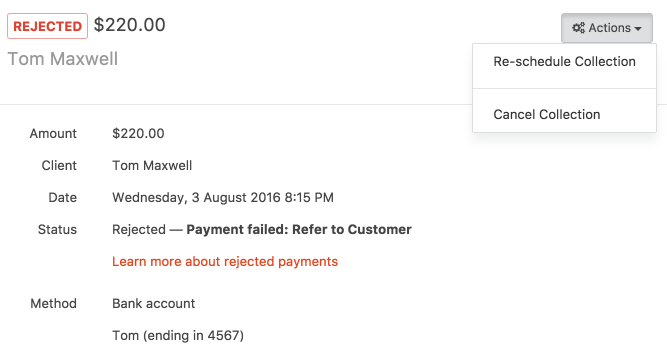 You can retry the payment by going to the collections tab in the Payments tab, then go to the Rejected list. If you click on a rejected payment, a drawer will open showing the payment details. Click the Actions button and you'll see options to Re-schedule or Cancel the payment. You'll then be able to choose whether you want to try collecting payment again today, or on a future date. Once you've chosen when to try collecting payment, the payment collection will disappear from the "Rejected" and move to "Pending Collection". It will only re-appear in "Rejected" if payment collection is rejected again. If a payment for a recurring service is rejected, you will still need to manually retry the payment once the issue has been rectified. 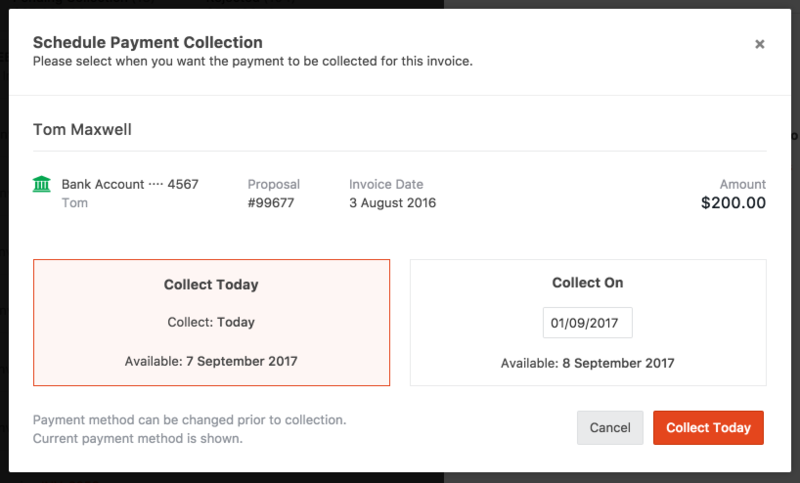 However, it's important to note that Practice Ignition will continue to attempt collection on all future scheduled invoices. The payment for May's transaction will process in May as scheduled (per your payment settings). The payment for June's transaction will process in June, and so on. If you have not retried the April payment by the time the next recurring payment is processed, it will remain in rejected until you do so. As a best practice, we recommend you reach out to your client and attempt to rectify the rejected payment before the next scheduled recurring date.